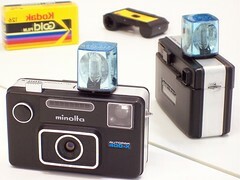 Minolta (ミノルタ, minoruta) was a Japanese company that, under one name or another, manufactured cameras from 1929 to 2003. It produced cameras for many film formats, from 16mm film to medium format. In the 1950s Chiyoda, as it was then called, ventured beyond production of cameras and binoculars into business services, and eventually into photocopiers. Most branches of the company were related to optics: the copier branch, the exposure meter branch, etc. Minolta was succeeded by Konica Minolta after the merger with Konica in 2003. The merged company sold its remaining camera interests to Sony in 2006; the Minolta "A" lens mount lives on in Sony's current line of DSLRs. The company was founded in Osaka on November 11, 1928 by Kazuo Tashima, under the name Nichidoku Shashinki Shōten (日独写真機商店, meaning Japan-German Camera Store). Tashima got support from the German camera technicians Billy Neumann and Willy Heilemann, and the first cameras used lenses and shutters imported from Germany. A plant was built in Mukogawa (武庫川), in the prefecture of Hyōgo (兵庫県). The first camera produced by the company was the Nifcarette released in 1929. It was followed by the Nifcaklapp and Nifcasport folding cameras and by the Nifca-Dox strut-folder, all taking film plates or pack film. At this early period, all the cameras were directly advertised and distributed by the company, which was using a round logo with the letters N, D, PH and Co assembled inside a circle, surely for Nichi Doku Photo Company. In 1930, a strike occurred in the Mukogawa plant, whose director was Willy Heilemann. Heilemann dismissed all the strikers and opposed Tashima, who was favouring more moderate measures. In 1931 the company was transformed into a stock corporation named Molta Gōshi-gaisha (モルタ合資会社), where Molta is an abbreviation of the German "Mechanismus Optik und Linsen von Tashima" ("Mechanism, Optics and Lenses by Tashima"). The mention of Germany disappeared from the company name, and Heilemann and Neumann left the company respectively in November 1931 and in 1932, to found their own Neumann & Heilemann company, taking some employees with them. The camera range was accordingly renamed: the Nifcarette became the Sirius Bebe, the Nifcaklapp became the Sirius and the Nifcasport became the Arcadia. The cameras were still distributed by the company itself for a couple of years, and the Sirius and Arcadia were also distributed by Misuzu Shōkai as the Lomax and Eaton. Molta later entered an agreement with the Tokyo-based distributor Asanuma Shōkai, and the Sirius and Arcadia plate cameras were replaced by the Happy (whose brand name was owned by Asanuma). The Asanuma company would distribute the Happy and Minolta cameras and assume all the advertising until 1945. Registration of the Minolta trademark (1933). Downloaded from the IPDL, in accordance to the IPDL policies. The name Minolta was applied for and registered in 1933, and it was first used for a camera plainly called Minolta, inspired by the Plaubel Makina. A round MTS logo appeared at the same time, perhaps standing for "Molta Tashima" or "Minolta Tashima". Many sources say that the Minolta name was crafted from "Mechanismus, Instrumente, Optik und Linsen von Tashima" ("Mechanism, Instruments, Optics and Lenses by Tashima") but it is more likely a backronym, inspired by (i) minoru ta (稔る田), "ripening rice-fields" (a strong image of health and fruitfulness in Japan, and in Japanese pronounced identically to "Minolta"), and (ii) "Molta" itself. All the later model names included the word "Minolta", but the company name and brand name would differ until 1962. In 1934, the company released the Minolta Vest, originally designed by Ehira Nobujirō, with an innovative system of collapsible boxes replacing the bellows. 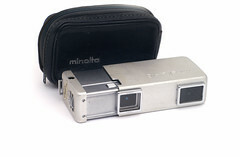 The Semi Minolta was announced at the very end of 1934 and sold from 1935. 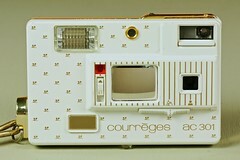 It was the second or third 4.5×6cm camera made in Japan. In 1936, the company created the subsidiary Nippon Kōgaku Kikai Kenkyūjo (日本光学機械研究所, meaning Japanese Opto-mechanical Research Institute) in the city of Amagasaki (尼崎市), in the Hyōgo prefecture, to manufacture the bakelite cameras such as the Minolta Vest, Minolta Six and Baby Minolta. This subsidiary was soon merged into the main company, and became the Amagasaki plant. In February 1937, the company opened a third plant in the city of Sakai (堺市), in the Osaka prefecture. Chiyoda Kogaku, the company name from 1937 to 1962. In September 1937, the company became Chiyoda Kōgaku Seikō K.K. (千代田光学精工㈱, meaning Chiyoda Optics and Precision Industry Co., Ltd.), abbreviated "Chiyoko" (千代光) on some logos and publications. (The word Chiyoda was created with the characters 千代, meaning "one thousand generations" and 田, the first character of Tashima's name; it conveys the meaning that Tashima's company will last a thousand generations.) The same year 1937, the company established closer ties with Asanuma Shōkai, which quit distributing other cameras to concentrate exclusively on cameras from the Chiyoda company. This association became so close that many customers believed that the Minolta cameras were made by Asanuma; the agreement lasted until the end of the war, but the two companies retained some commercial contacts for some time afterwards. The two companies organized a show in December in the Tōkyō Kaikan (東京会館, a reception lounge in Tokyo, near the Imperial Palace) to celebrate the new agreement. Three expensive and advanced new models were displayed at this show: the Auto Semi Minolta was the first serial produced Japanese camera with a combined range and viewfinder, the Auto Press Minolta (an evolution of the Minolta and Auto Minolta Plaubel Makina copy) was the first Japanese camera synchronized for flash and the Minoltaflex was the second Japanese 6×6 TLR. 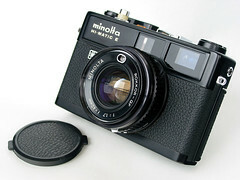 It seems that the taking lens of the Minoltaflex was made by the company, surely in the Sakai plant — these were perhaps the first lenses made by Chiyoda. The production of Rokkor lenses began in 1940, but they were only for military use. It also produced military ordnance, including hand-held cameras for aerial reconnaissance. The civilian camera production was stopped around 1943. At about that time, the company apparently made one or more prototypes of an interchangeable-lens TLR camera, which was the first 6×6 TLR in the world to have interchangeable lenses. The three original plants of Mukogawa, Amagasaki, Sakai ended up participating to the war effort. A fourth plant was opened in Komatsu (小松) in 1939, initially specialized in machine tools. In 1942, the Japanese Navy asked the company to open a glass melting facility; the new plant was built in Itami and only operational in 1944. In 1943, the company also took over Fujimoto's plant in the city of Nishinomiya (the former Neumann & Heilemann factory), which became Chiyoda's Nishinomiya (西宮) plant. It perhaps continued the production of Fujimoto leaf shutters for a short time. The Mukogawa, Amagasaki and Komatsu (小松) plants were destroyed by aerial bombing. The Sakai, Itami and Nishinomiya plants survived the war, as well as a dispersal plant in Honsha (本社). The company resumed camera production shortly after the war with the Semi Minolta III. This camera was equipped with a Rokkor 75/3.5 that was the first Japanese coated lens commercially available, and also the first lens made by the company for civilian use. The company also absorbed the optical section of the Toyokawa Navy Arsenal (Aichi prefecture), which became the Toyokawa (豊川) plant in November 1946. The Memo of 1949 was Minoltas first 35mm camera, again a sophisticated bakelite camera which already had a rapid film advance lever. In 1950, Chiyoda released the Konan-16 Automat, a subminiature camera that used its own 16mm film format. 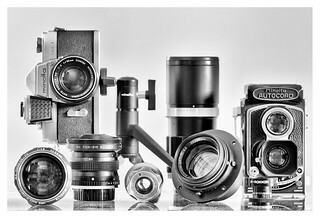 Throughout the 1950s, the range consisted of TLR cameras, 4.5×6 folders, 35mm viewfinder and rangefinder cameras and 16mm subminiature cameras. The SR-1 succeeded the SR-2. Minolta signed a cooperation agreement with Leitz in June 1972. 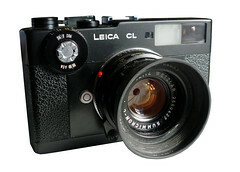 The first products resulting from this appeared in 1974: the Minolta XE SLR and the Leica CL rangefinder camera (sold in Japan as the Leitz Minolta CL). The XE was the basis for the 1977 Leica R3. 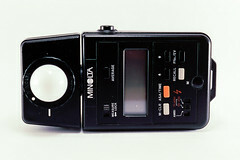 The final result of the association with Leitz was the Minolta XD-11 (the same as XD-7, and the basis of the Leica R4). It was the first 35mm SLR camera combining both aperture priority and shutter priority automatic exposure modes. Many Rokkor lenses of the new MD series, usable in both automatic modes, were produced for this camera. In 1981, Minolta launched the CLE, a rangefinder camera with M-mount, the first one to have (aperture-priority) automatic exposure. The metering system was of the "TTL OTF" type (through the lens, reflected off the film), first introduced by Olympus in 1975 on the OM-2 SLR camera. 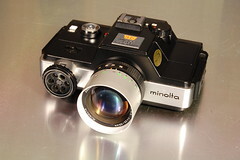 The CLE was also the first Minolta camera to have TTL flash automation, together with the X-700 SLR introduced the same year. After the heady days of the XD/XE series, the X-700 marked a definite return to the amateur-level market. While the new camera had TTL flash, it was equipped with only a 1/60s maximum flash synch and an ordinary cloth horizontal-travel shutter, and the interior mechanisms utilized more cost-saving plastics. With a large investment in a new autofocus SLR design, Minolta decided to withdraw from building professional-level manual-focus SLR cameras. 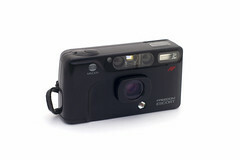 Further cooperation occured in 1989, when Minolta made the Leica AF-C1. In 1982 the company's founder Kazuo Tashima stepped down as president of the company, and his son Hideo Tashima became his successor. Kazuo Tashima stayed in the company as chairman of the board until his death in 1985, at the age of 85. The Nishinomiya plant, which hosted research and development activities as well as a service center, was closed in April 1985. 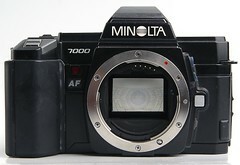 The Minolta 7000 AF SLR camera was introduced in 1985. It was the world's first "in-body" autofocus SLR. Before this time manufacturers had dabbled with lenses that focused themselves but that fitted their existing, manual-focus SLR cameras. 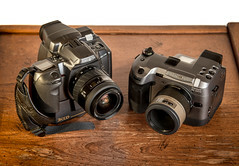 Unlike other manufacturers, Minolta invested much of its resources in the new autofocus cameras, at the expense of its manual focus SLRs, which were repositioned as amateur level cameras. It was the first manufacturer to put the mechanism and electronics for the autofocus system into its SLR camera bodies and so the modern SLR was born. The rest of the camera had an advanced design, with liquid crystal screen display, built-in film winder, and a body built largely of plastics. For five years beginning in 1985, Minolta was the biggest seller of SLR cameras in the worldsource needed, because of the 7000 and the later Alpha/Dynax/Maxxum system. However Minolta did not hang on to its technological lead for long as Canon and Nikon both introduced new autofocus designs of their own, with a wide array of new lenses and professional bodies. 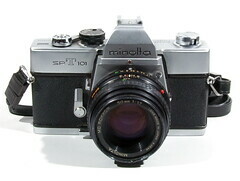 Minolta in turn tended to concentrate on the affordable end of the SLR market, and sought revolutionary rather than evolutionary changes. Among camera aficionados, Minolta was known both for its very high performance-to-price ratio and its constantly changing array of new models. After popularizing the plastic-bodied, push-button-controlled SLR with the 7000, and a relatively unsuccessful line of complex 35mm SLRs with a electronic 'expansion card' feature, the company moved towards a more traditional user interface in the mid-90s with the 600si Classic. This interface was carried forward into its popular pro-level Minolta Alpha/Dynax/Maxxum 9 and later, the Maxxum 7. 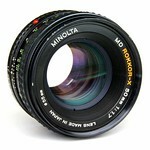 Unfortunately for Minolta, its autofocus design was found to infringe on the patents of Honeywell, a U.S. corporation. After protracted litigation, Minolta in 1991 was ordered to pay Honeywell damages, penalties, trial costs and other expenses in a final amount of 127.6 million dollars. 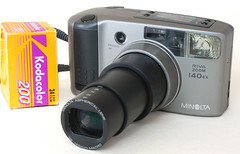 Like other camera manufacturers, Minolta faced difficulties in building low-priced, consumer level cameras, though its emphasis on this sector of the market may have affected the company more than some other brands. The company was one of the first to offshore production of its cameras from Japan to Malaysia, China, and other countries offering less expensive labor costs. Minolta occasionally redesigned parts in existing models with less expensive materials, or introduced new, less expensive designs, all in an effort to cut costs. 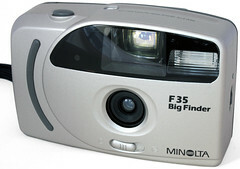 In 1996 Minolta became engaged in the attempt to establish a small versatile modern user-friendly film cartidge type to replace 35mm film. Like some other camera and film makers it launched several fully automatic cameras for the new Advanced Photo System, added APS film adapters to its film scanners and even created its new autofocus SLR camera system for APS film, with the new Minolta V mount. The company began offering consumer-level digital cameras in the late 1990s. 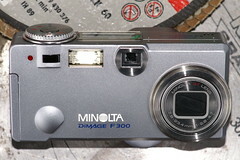 With the DiMAGE X, Minolta solved the problem of the protruding optical zoom lens on pocket digicams. Its folded lens design allows an optical zoom lens to be totally contained within the body of the camera. This makes the cameras that use this design truly pocketable, faster to turn on and better protected from knocks and damage. 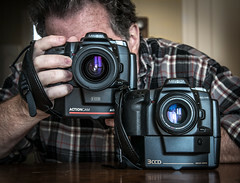 They did not sell too well and did not lead nor define the market for digital SLRs, but have maintained a cult status among some Minolta collectors. As a result, Minolta has been criticized for its slowness to bring out modern, competitive digital SLR cameras for the popular SLR photography market, compatible with the many popular Alpha/Dynax/Maxxum-mount lenses in use. In late November 2004, the new Konica Minolta company finally released the much anticipated Konica Minolta Alpha/Dynax/Maxxum 7D Digital SLR and the innovation continued. What sets the 7D DSLR apart from the competition is the built-in image stabilization which works with any electronic autofocus lens attached to the camera body. In October 2003 Minolta merged with Konica to form Konica Minolta. All new cameras after that time were badged as Konica Minolta, although, with reference to camera designs, Minolta remained the dominant partner. As of spring 2006, Konica Minolta has withdrawn from the camera business entirely. The digital camera manufacturing assets have been acquired by Sony, but film camera production is ceasing, and the film and mini-lab divisions are set to close within a year. Konica Minolta now is solely a business servicer with no photo division. In 2017 the company Konica Minolta seems to have given away the rights on the brand name "Minolta" to EBI (Elite Brands Inc.). 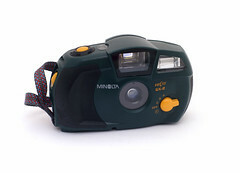 That way EBI got the right to use the name "MINOLTA" as their own registered trademark. It offers a bridge camera, and some compact digicams as well as some so-called dashcams, a kind of action cams for automobiles, as products of Minolta Digital, whoever may be the real manufacturer of these products. Minolta and Konica Minolta used the DiMAGE name-plate on nearly all its original fixed lens digital cameras. For some early Minolta digicams the badge Dimâge was used instead. All have auto-focus and nearly all a zoom lens. Newer digital cameras, especially DiMAGE Z-series, G-Series, DG-Series, further E-, X- and A-models, see Konica Minolta. The Minolta Alpha/Dynax/Maxxum (Alpha in Japan and China, Maxxum in the Americas, Dynax in Europe, Africa and Asia) is a line of 35mm film SLR cameras built from 1985 to 2000 - some "new old stock" may still be available. The lenses and flash accessories for these are not compatible with the previous Minolta SR, SR T, and X-series of manual focus 35mm film SLR cameras, lenses and flashes. 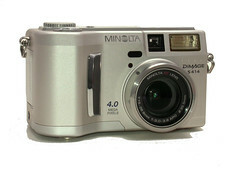 The last models appeared badged as "Minolta" despite of the merger with Konica in 2003. If anyone knows of additional models and or knows which of these are equivalent across the Alpha/Dynax/Maxxum divide, please pitch in! Note that early models were also named "AF". 1) 3rd area: Minolta used this expression to indicate all other export markets than North America and Europe. 2) Taken from Minolta Fifty Years Chronicle (Minolta, November 1978) and "70 Jahre Minolta Kameratechnik" (Scheibel, 1999, ISBN 3-89506-191-3). 3) The Minolta ER was a fixed lens SLR and thus not part of the Minolta SR system. The Minolta Activa series binoculars are nitrogen-filled (fogproof) as well as weatherproof or waterproof. The Mariner series offered a rugged construction typical of marine binoculars. Interestingly, Minolta did not offer a Mariner version of their 7x50 binoculars, which is considered a standard by sailing enthusiasts. 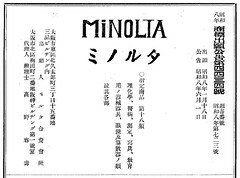 Trademark publication for the name "MINOLTA" (ミノルタ). The trademark was applied for (商標出現) on 18 January 1933 (no.S08-000723), published (商標広告) on 1 June 1933 (no.S08-004434) and registered (商標登録) on 20 September 1933 (no.0246579). Available in the IPDL trademark database. ↑ Logo found on the ground glass holder of the original Minolta and on accessory cases. ↑ Date: Tashima, Watakushi no rirekisho, quoted in Tanimura, p.96 of Kurashikku Kamera Senka no.12. The address of the company in the early 1930s was Ōsaka-shi Higashi-ku Kita-kyūtarō-machi 3-chōme 15-banchi Mishina Building (大阪市東区北久太郎町三丁目十五番地三品ビルヂング内). Sources: advertisements dated 1930 to 1932 reproduced in Hagiya, p.9 of Kurashikku Kamera Senka no.12, trademark publication (商標広告) no.S08-004434 for the name "MINOLTA" (ミノルタ), dated 1933, available in the IPDL trademark database, and patent for the Crown E shutter dated 1934, reproduced in Tanimura, pp.5–7 of Camera Collectors' News no.131, and on p.19 of Kurashikku Kamera Senka no.12. ↑ Awano, p.6 of Kurashikku Kamera Senka no.12. ↑ Directly advertised and distributed by the company: advertisements dated 1930 and 1931 reproduced in Hagiya, p.9 of Kurashikku Kamera Senka no.12, and in Awano, p.6 of the same magazine, were placed by Nichidoku Shashinki Shōten and have the Nichidoku logo, and all the brand names were clearly owned by the company. ↑ Kikan Classic Camera 14, p.14. ↑ Taniguchi, p.276 of Shashin Kōgyō no.77 (article also reproduced in Tanimura, p.8 of Camera Collectors' News no.116), Francesch, p.19. ↑ Tashima, Watakushi no rirekisho, quoted in Andō, p.2 of Camera Collectors' News no.127. The dates are repeated in Tanimura, p.96 of Kurashikku Kamera Senka no.12, Awano, p.6 of the same magazine. ↑ All the advertisements for the Minolta or Happy cameras from the mid-1930s to 1945 were placed by Asanuma Shōkai. ↑ Trademark registration (商標登録) no.246579, for the name "MINOLTA" (ミノルタ), in the IPDL trademark database. ↑ The etymology minoru ta (稔る田) is mentioned in Taniguchi, p.276 of Shashin Kōgyō no.77 (article also reproduced in Tanimura, p.8 of Camera Collectors' News no.116). this Japanese page wonders if minoru ta was adapter from moru ta written 盛る田. ↑ The Semi Prince came first and the Semi Proud and Semi Minolta closely followed. ↑ Awano, p.7 of Kurashikku Kamera Senka no.12, Francesch, p.23. ↑ Awano, p.7 of Kurashikku Kamera Senka no.12, Francesch, p.23. The address is given as Amagasaki-shi Nanba (尼ヶ崎市難波) by the "Kokusan shashinki no genjōchōsa" ("Inquiry into Japanese cameras") dated April 1943. ↑ Awano, p.7 of Kurashikku Kamera Senka no.12, Francesch, p.25. ↑ Date: Awano, p.7 of Kurashikku Kamera Senka no.12, Francesch, p.25. ↑ Taniguchi, p.276 of Shashin Kōgyō no.77 (document also reproduced in Tanimura, p.8 of Camera Collectors' News no.116), and Awano, p.7 of Kurashikku Kamera Senka no.12. ↑ See for example the 1952 advertisement by Asanuma Shōkai for the Minolta Semi P reproduced in Kokusan kamera no rekishi, p.194. ↑ Taniguchi, p.276 of Shashin Kōgyō no.77 (document also reproduced in Tanimura, p.8 of Camera Collectors' News no.116), and Awano, p.7 of Kurashikku Kamera Senka no.12 (specifying that the show was inaugurated on December 12, 1937). Tashima Gizō says November in the interview by Saeki on p.77 of the same magazine, certainly by mistake. ↑ The first Japanese 6×6 TLR was the Prince Flex. ↑ Kikan Classic Camera 14, p.38, says that the Minolta Anastigmat Nippon viewing lens of the Minoltaflex (I) was made by Chiyoda. The same source says on p.15 that the Sakai plant produced lenses from 1937, and this is also found in Francesch, p.25. ↑ Date: Ema, p.90 of Kurashikku Kamera Senka no.12. ↑ Tanimura, p.21 of Kurashikku Kamera Senka no.12 (about the Semi Minolta). ↑ Francesch, p.27, says July 1942 and January 1944; Ema, p.93 of Kurashikku Kamera Senka no.12, says January 1942 and June 1944. ↑ The Rapidex shutter, developed by Fujimoto, is attributed to Chiyoda in the 1943 government inquiry, perhaps for that reason. Source: "Kokusan shashinki no genjōchōsa" ("Inquiry into Japanese cameras"), shutter item 18-P-27. ↑ Francesch, p.27, Awano, p.7 of Kurashikku Kamera Senka no.12. ↑ Sakai, Itami, Honsha: Awano, p.7 of Kurashikku Kamera Senka no.12. Sakai, Itami, Nishinomiya: Francesch, p.27. This is confirmed for Nishinomiya by Tanimura, p.99 of Kurashikku Kamera Senka no.12. ↑ Optical section of the Toyokawa Navy Arsenal: Awano, p.7 of Kurashikku Kamera Senka no.12. Date: Francesch, p.29. ↑ Corporate profile of Konica Minolta Planetarium Co., Ltd. The first planetarium apparatus made in Japan was made by Gotō Kōgaku: see the about page of Goto Inc.
↑ Konica had been the first to put autofocus into a 35mm camera, but it was a fixed lens "compact" camera; and Polaroid had been the first to put autofocus into an SLR camera, but it neither was 35mm nor was an interchangeable lens design. ↑ Minolta Brand Ownership Registration, filed 2017, registered 2018 on trademarks.justia.com , saying that JMM Lee Properties, LLC, holds the rights on the brand name. JMM Lee is owner of Elite Brands, NYC, marketing agency for the brands Minolta, Coleman, Rokinon, Bell & Howell and others. ↑ Nakagawa, p.120 of Kurashikku Kamera Senka no.51. Andō Yoshinobu (安藤嘉信). "Arukadia no nazo" (アルカデリアの謎, Arcadia mystery). In Camera Collectors' News no.127 (January 1988). Nishinomiya: Camera Collectors News-sha. Cooper, Joseph D. The Minolta Manual, Verlan Books Inc., 1st edition, New York 1959. Library of Congress Card 59-12540. Eimukku 735, Manyuaru Kamera Shirīzu 15 (エイムック735・マニュアルカメラシリーズ15). Minolta: Minoruta kamera no subete (Minolta:ミノルタカメラのすべて, Minolta: all of Minolta cameras). Tokyo: Ei Shuppansha, 2003. ISBN 4-87099-923-4. Hagiya Takeshi (萩谷剛). "Kōkoku ni miru Minoruta kamera no rekishi" (広告に見るミノルタカメラの歴史, Minolta camera history seen through the advertisements). Kamera Rebyū: Kurashikku Kamera Senka (カメラレビュー クラシックカメラ専科) / Camera Review: All about Historical Cameras no.12, October 1988. No ISBN number. Minoruta kamera no subete (ミノルタカメラのすべて, special issue on Minolta). Pp.9–12. Kikan Classic Camera 14 Tokushū: Minoruta Rokkōru densetsu (季刊クラシックカメラ14・特集ミノルタロッコール伝説, special: Minolta Rokkor legend). Tokyo: Futabasha, 2002. ISBN 4-575-47427-4. Saeki Kakugorō (佐伯恪五郎). "Tashima Gizō-shi ni kiku" (田嶋義三氏に聞く, "Asking Tashima Gizō"). Kamera Rebyū: Kurashikku Kamera Senka (カメラレビュー クラシックカメラ専科) / Camera Review: All about Historical Cameras no.12, October 1988. No ISBN number. Minoruta kamera no subete (ミノルタカメラのすべて, special issue on Minolta). Pp.76–9. Scheibel, Anni Rita and Joseph. 70 Jahre Minolta Kameratechnik — Von der Nifcalette bis zur Dynax 9. Stuttgart: Lindemanns Verlag, 3rd edition, 1999. ISBN 3-89506-191-3. Tanimura Yoshihiko (谷村吉彦). "Semi Minoruta I-gata gaibun." (セミミノルタⅠ型外聞, Things heard about the Semi Minolta I) In Camera Collectors' News no.131 (May 1988). Nishinomiya: Camera Collectors News-sha. Tanimura Yoshihiko (谷村吉彦). "Supuringu kamera <semi minoruta>" (スプリングカメラ<セミミノルタ>, 'Semi Minolta' self-erecting camera). Kamera Rebyū: Kurashikku Kamera Senka (カメラレビュー クラシックカメラ専科) / Camera Review: All about Historical Cameras no.12, October 1988. No ISBN number. Minoruta kamera no subete (ミノルタカメラのすべて, special issue on Minolta). Pp.19–24. This page was last edited on 16 April 2019, at 17:34.